Miniature steamed bun; perfect for sweet or savory mixes. Steamer: From frozen place in a steamer and steam on mid-high heat for 8-10 minutes to serve. Microwave Oven: From frozen place 6 pieces of buns in a microwaveable plate, and cover with a piece of wet paper towel. Heat on high for 45 seconds to serve. Looking for a great addition for action stations? 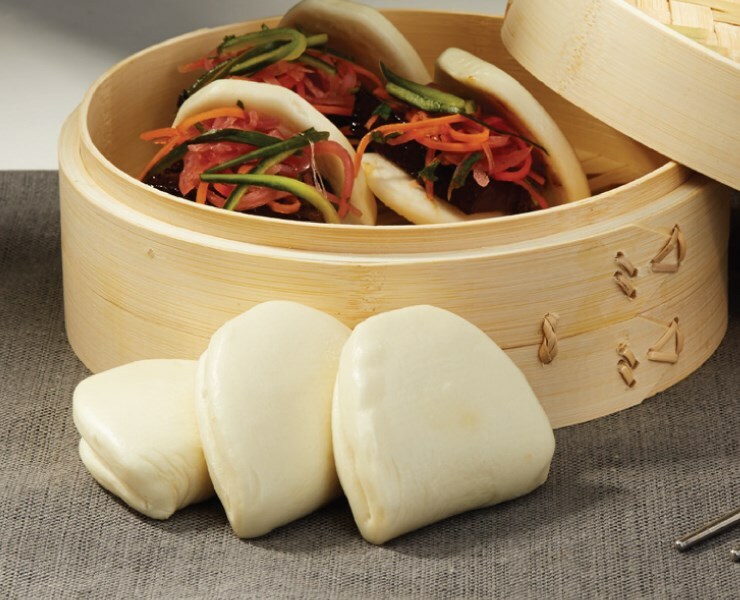 Look no further than Kabobs’ K0909 Mini Steamed Buns. Based off the traditional Asian component item, these mini steamed cakes are perfect for both sweet and savory ingredients. Simply steam and fill with your favorite ingredients. Great with Hoisin BBQ marinated Pork Belly, or try with Kabobs’ K2415 Tandoori Chicken Satay with pickled cucumbers, carrots, and basil. • Component item. Neutral flavor, great for both sweet and savory ingredients. Simply steam and fill with your favorite ingredients. Great with Hoisin BBQ marinated Pork Belly, or try with Kabobs’ K2415 Tandoori Chicken Satay with pickled cucumbers, carrots, and basil. Hand formed corn cakes, capturing generations of artisan mastery; mixed with jalapenos, Monterey Jack cheese, and fresh green onions. Excellent plain or as a stepping block to a personal culinary masterpiece. Lobster, accented with sweet shoepeg corn, heavy cream, cilantro, a splash of lime juice, and wrapped in a jalapeno and cheddar cheese masa pastry. A distinctive blend of chopped Manzanilla & Kalamata olives mixed with Manchego and cream cheese. Rounded then breaded to create a crispy and creamy bite of olive. An herbed mini tart shell filled with seasoned beef, thyme, chives, onion and a dash of Port wine. A topping of creamy mashed potato with cheese is used to garnish this all time favorite. A South American inspired empanada, consisting of a sweet and savory mix of slowly smoked beef brisket, crushed tomatoes, chopped jalapenos, Monterey Jack Cheese, and accented with sweet golden raisins; wrapped in a maseca pastry. Hardwood smoked bacon, simmered with balsamic vinegar, port wine, brown sugar, onions, heavy cream, a hint of blue cheese, and placed in a quinoa tart shell. A southern classic, capturing good old country cookin??? and charm. Delicate shrimp with robust andouille sausage, paired with a roasted new potato and onion, hand skewered and brushed with Old Bay butter. K7071 Mac n' Cheese Melts - Tender pasta, Gruyere, Monterey Jack and cheddar cheese and chives.